Recently, my much better half and I were nicely chilled out in gorgeous Cava celebrating our 10 year anniversary. There’s nothing better than tapas and red wine to say “thank you” to Natasha for putting up with me for this long! Between the relaxed candlelit mood and the mouth- watering smells, it really is one of our favourite places. The empty plates were starting to stack up in front of me and I felt sorry for the poor waiter who was basically doing shuttle sprints back and forth from the kitchen to keep up with my order. Look it’s not often you’re 10 years with someone, so I was celebrating in style. Don’t judge me! I decided to finish strong and order one last dish before my churros capped off my dining experience. Our waiter came over with the menu and surprisingly asked “more sir” To which I responded with a confident nod to indicate I’ve got this! I started looking through the menu (yet again) and suddenly felt a feeling of overwhelm. I had enjoyed every mouthful so far, knew I could fit in one more dish, yet I sat there absolutely clueless what to choose. All these delicious options and I just couldn’t pick one! 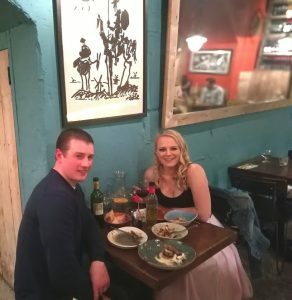 I ended up handing back the menu and asking him which he recommended and his choice of Connemara lamb went down a treat. Then it dawned on me, that this must be how a lot of people feel when it comes to health and fitness. So many choices you just feel over whelmed. Too many options, you just don’t know which one. The laundry list of exercises options ranging from TRX to kettlebells, barbells to spinning, bootcamps to crossfit. An even larger array of diet choices further compound confusion. Everything from no carbs to high carbs, full fat to gluten free and slimming clubs or detoxing. Is it little wonder people are conflicted and confused? Throw into the mix that we are all like magpies and get distracted by the next shiny thing that promises even quicker results. Why the hell would I want a six pack abs in 6 days when I can get them in 6 hours with this new innovation? Don’t get me wrong, choice is amazing. To have so many options out there is a great complaint. But sometimes overwhelm can cause inaction. My advice would be to just pick something and stick with it long enough to be able to evaluate it. Don’t decide to start zumba, power lifting and bootcamps while being a high fat vegan who’s gluten free. Have a look at what options are available to you. Pick one that you will enjoy. Stay with it and then reassess. Or if you are like me when I was in Cava and need help, just pop me a message and I’ll guide you in the right direction for you.